Attorney General, Hon Vincent Byron addresses economic citizens and agents during a forum in Dubai. Looking on is Minister of Foreign Affairs, the Hon. Mark Brantley. 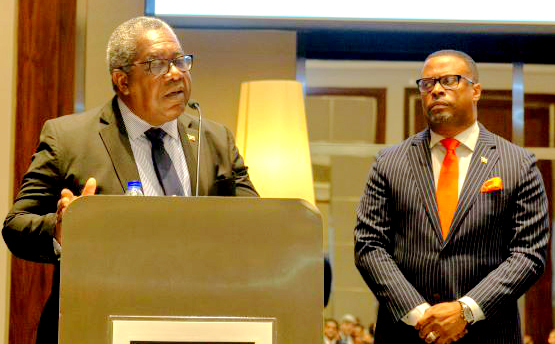 BASSETERRE, St. Kitts –- The Federation is taking steps to strengthen the Saint Christopher and Nevis Citizenship (CBI Escrow Accounts) Bill, Attorney General, the Honourable Vincent Byron told a meet and greet forum with economic citizens and agents in Dubai last week. The CBI Escrow Accounts legislation, passed in November 2017, provides guidelines relating to escrow accounts and agreements under the CBI Programme. An escrow, under the CBI Programme, is a short-lived trust arrangement, which is the main mechanism for the consummation of real property sales. An escrow agent is a third party responsible for oversight of the monies, whilst the buying and selling process is being undertaken. Chief Executive Officer of the Citizenship by Investment Unit (CIU), Les Khan, stated that the new legislation will significantly strengthen the country’s CBI programme by paying particular attention to construction and the payout of funds in escrow. The Saint Christopher and Nevis Citizenship (CBI Escrow Accounts) Bill, 2017, contains a clause that identifies who would be allowed to be CBI escrow agents in St Kitts and Nevis,” said Khan. “These include a bank or any other entity whose business includes the provision of trust or custodial services; a registered trust company or any other entity whose business is the provision of trust or custodial services; an attorney-at-law; or a chartered accountant – all under certain conditions. It also requires all CBI escrow agents to be licensed, and to conduct their escrow business in accordance with specified guidelines.